Along the years, all major DSLR manufacturers have created and perfected their own tools for processing RAW images. Phocus is Hasselblad's solution for anything you would need in order to get the best out of a photo taken with any of their high resolution cameras before you export it for advanced post-production. It can handle TIFF and JPEG images as well as the 3FR and 3F formats. If you've dealt with other RAW processing solutions such as Lightroom, then using Phocus should be a breeze for you. It's not a copy but it does offer a similar layout and workflow. You have the file browser on one side, the thumbnail viewer on the bottom and the adjustment, file information and export panels on the other. Phocus enables you to switch between various layouts, as well as add and remove panels according to your needs. A feature that is sure to come in handy is the possibility to create your own layouts for the application which means that you are free to arrange a custom workspace for specific photography styles for file formats. When it comes to applying correction filters or enhancing certain features of a photo, Phocus comes with a fairly large arsenal of tools. With it you are able to correct lens distortions and vignetting, as well as make use of HNCS, Hasselblad's Natural Color Solution. 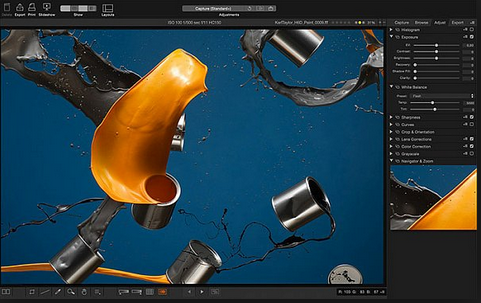 Since Hasselblad cameras are known for their high resolution images, Phocus enables you to remove moire directly from the raw file thus preserving all the details. Apart from these, the application also grants you the use of dust removal, sharpening, noise filtering, white balance and other must have tools. Hasselblad cameras are widely used in studio environments and are generally tethered to a computer in order to preview the photo for an immediate assessment of lighting, framing, fine details and for this reason Phocus also comes with a feature that allows you to control the camera from the application. Hasselblad cameras have made and are still making history in terms of quality and Phocus is not far behind when compared to similar software. With the above to consider and much more to discover, Phocus is indeed a tool which every Hasselblad camera owner should have. Phocus is supported on Windows 7 Service Pack 1 64-bit, Windows 8 64-bit, Windows 8.1 64-bit and Windows 10 64-bit.
? You should be aware that the Phocus viewer utilizes the processing power of the GPU - therefore using a PC with a high performance GPU is definitely an advantage.
? Image files from all Hasselblad FireWire based digital camera products are supported. Tethered operation will work with the same range of cameras except for the first generation Ixpress series.
? Capture of micro-step images is not supported.
? Scanner 3F files are not supported.
? 3F files generated by Phocus are not backward compatible with FlexColor!